There's nothing like a lovely bowl of soup as a winter (or autumn) warmer. I decided to make some soup for lunch last weekend and had half a butternut squash in the fridge that needed using up - so butternut squash soup it was! I found a recipe in Slimming World's Little Book of Soups which looked simple and tasty; to be honest you don't even really need a recipe for this! To serve two, chop half a butternut squash, half an onion and two small or one large potato and fry in Fry Light for a few minutes until the onion is translucent. Add 200ml vegetable stock and simmer until the vegetables are tender. In the meantime I made a loaf of white bread on the 'fast bake' setting on my breadmaker which took two hours. I love freshly-made bread with soup. Blend the soup to a puree in a blender or food processor. It will be quite thick so add water to taste - some people prefer a thicker soup. If you have added a lot of water, return to the pan to heat through. Serve with the fresh bread and enjoy! 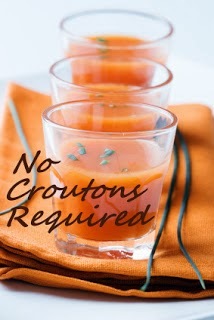 I'm sending this to No Croutons Required, hosted by Jacqueline at Tinned Tomatoes, as the challenge this month is to make a smooth blended soup that is suitable for vegetarians.